This post contains affiliate links. 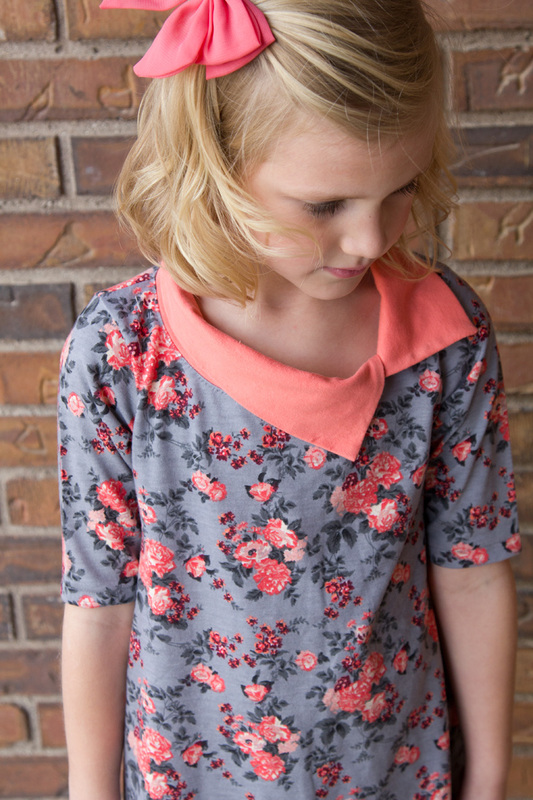 I became a Love Notions affiliate AFTER falling in love with her patterns and style. 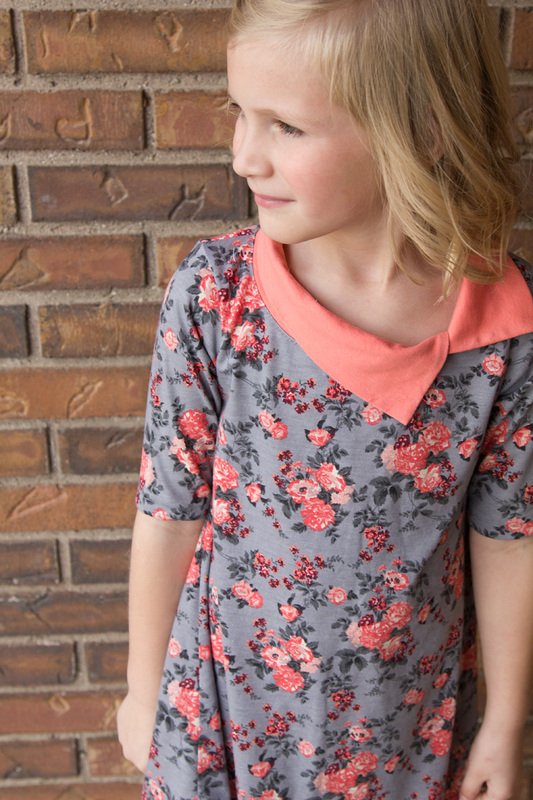 The sewing world has gone crazy for the Ladies Laundry Day Tee by Love Notions. 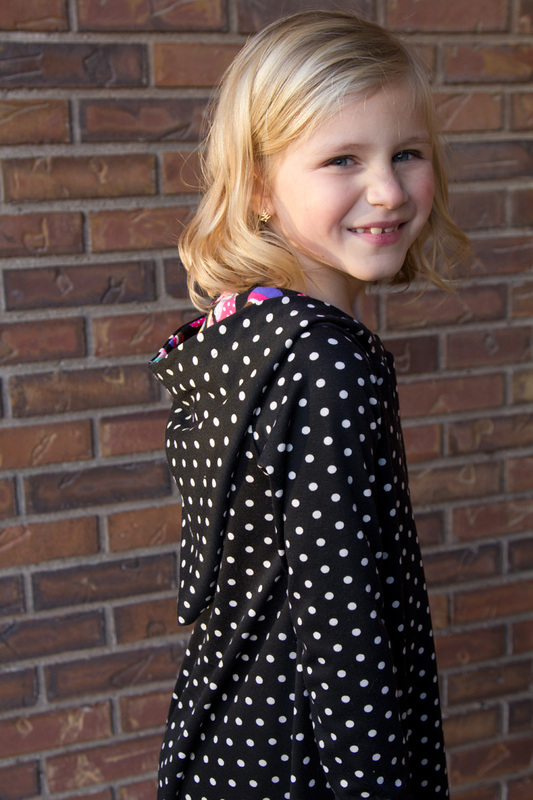 Tami at Love Notions has done it again with the Li’l LDT for girls. The options with this pattern are absolutely incredible. 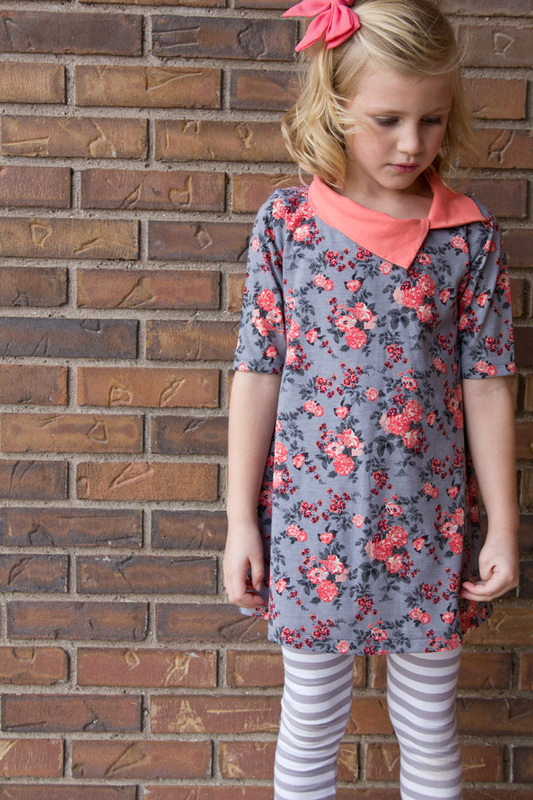 It comes in sizes 2t-16. 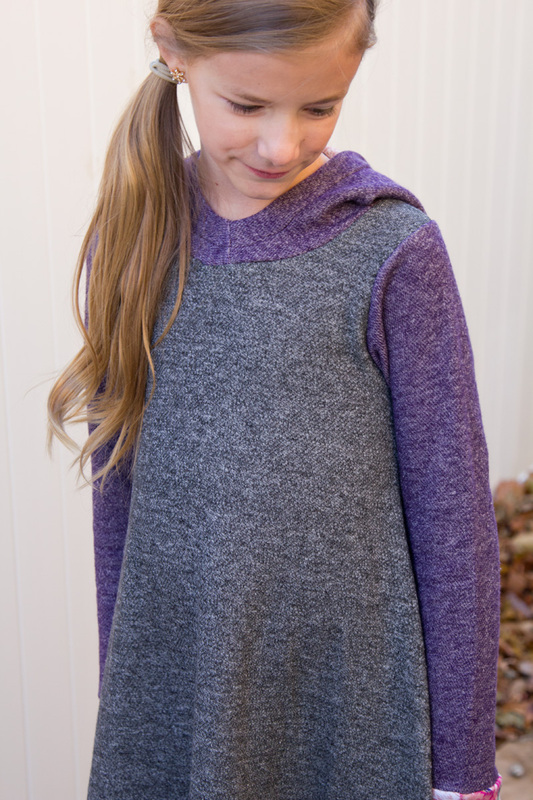 There are three different lengths- shirt, tunic and dress and high low options too! Five, yes five, sleeve options; tank, cap, elbow, long, and bishop sleeves. Finally there are a million, ok, maybe not quite a million neck finishes; neckband, asymmetrical collar, cowl, gnome hood, and rounded hood! How’s that for choices?!!! I used all fabrics from my stash and had to try out every kind of knit I owned. And guess what? They all worked just lovely! 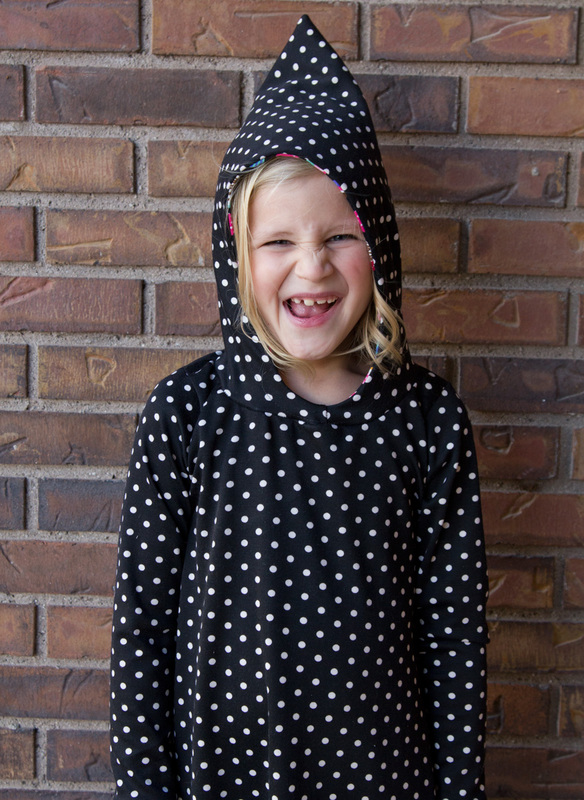 My first tester version was a dress length with long sleeves and a gnome hood. The fit of the shoulders changed a bit in the final version but you can see it was a good pattern to begin with. Payton thinks the gnome hood is so fun! This is a soft ponte and flows beautifully. 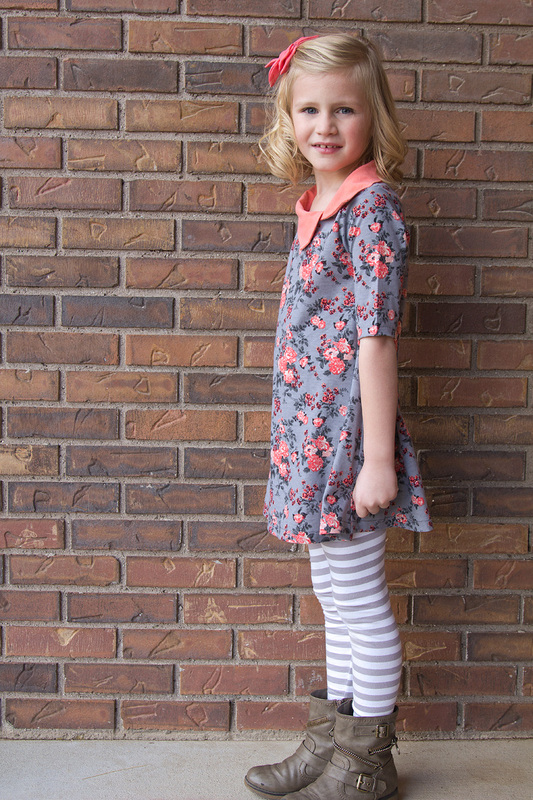 It’s got great twirl factor which is important if you’re six. 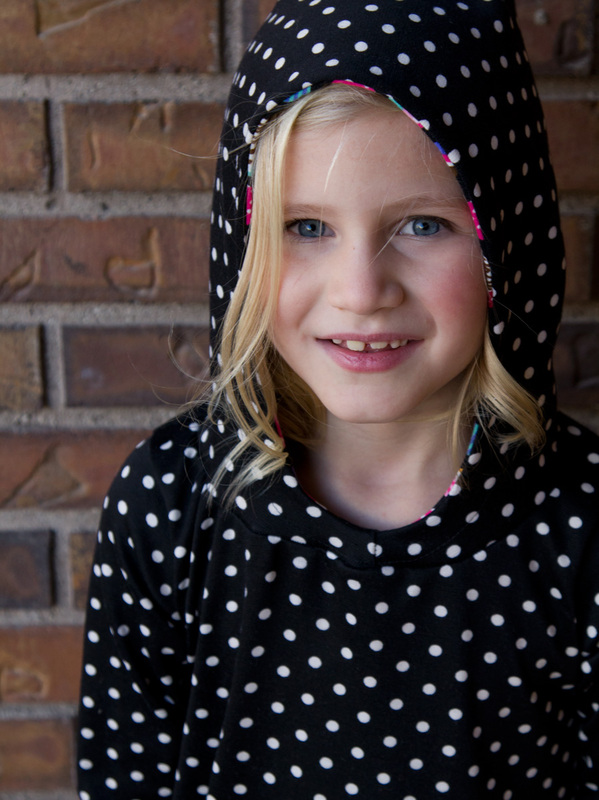 I cut into this gorgeous double-knit I picked up in Africa for Sophie’s long sleeve cowl version. I barely squeezed it out of a metre of fabric but it was just too perfect for this dress and my girl. She loves the color and it just fits her style to a tee. 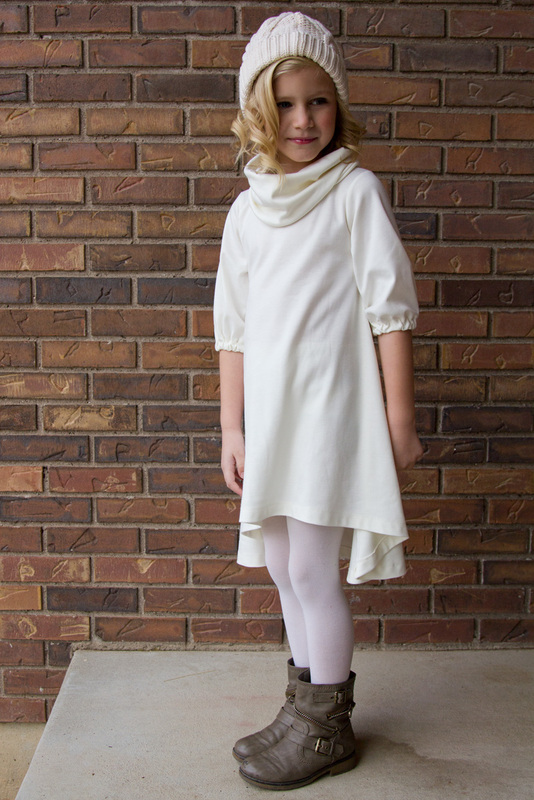 Next up is an asymmetrical collar tunic version. 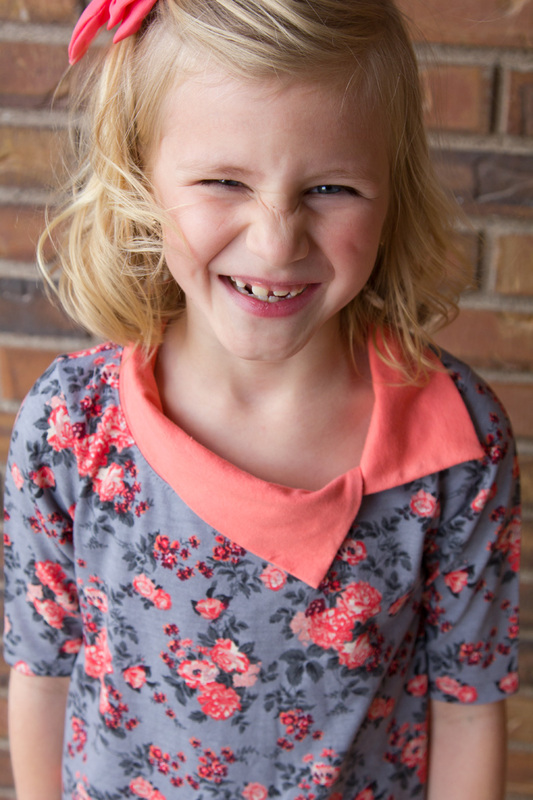 I used a Girl Charlee knit for the main and my trusty RCF coral for the collar. It’s just adorable and I foresee many of this version come spring/summer. You know I just HAD to do a french terry version. I’ve been wanting to try one for me but knew my girls would look WAY cuter in it. 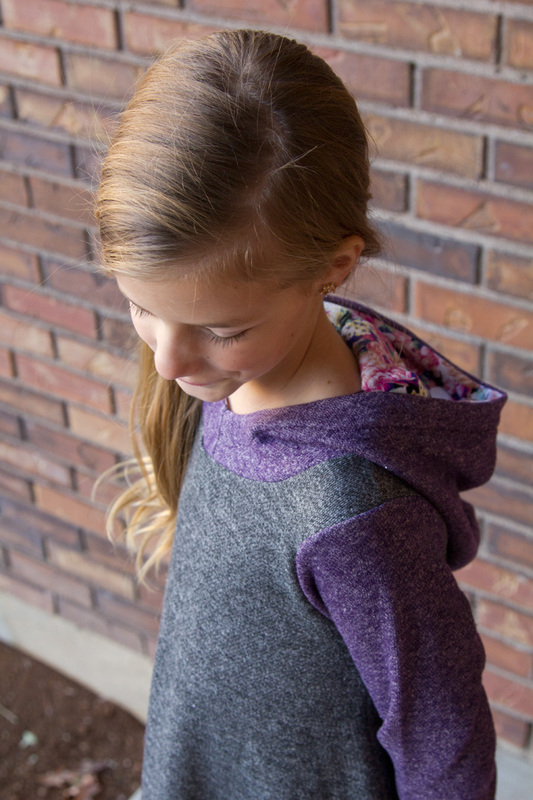 I did a regular hood and used Raspberry Creek Fabrics french terry. 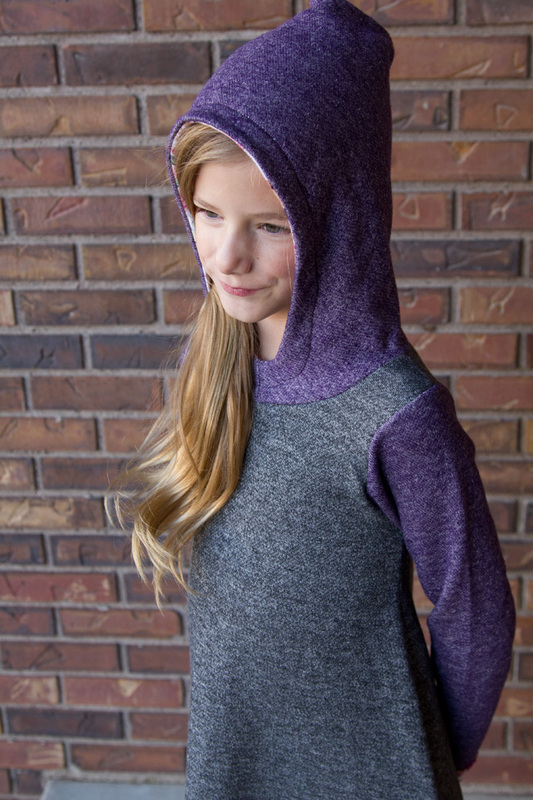 The drape of this particular french terry is just perfection! 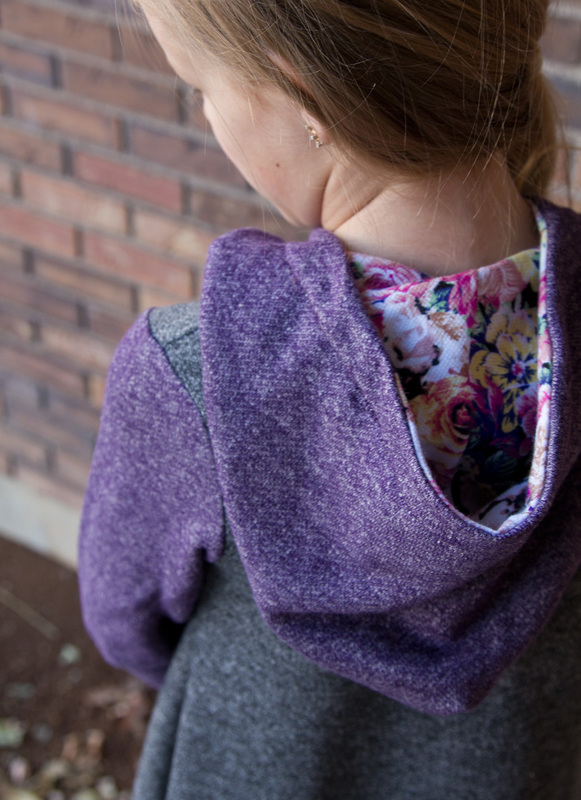 I scrounged up the last of this floral french terry I got in LA to line the hood and add bands to the sleeves. I wish I was wearing this myself right now! I’ll do a separate post tomorrow on my final and favorite version. I did a ‘fancy’ one using sparkle ponte that I just want her to wear everyday! Pick up your copy here and use code ‘forthegirls’ to save 20% through 12/19.